Would the Ares Pilgrims be against evolution, as rumor has it? Quite the contrary. 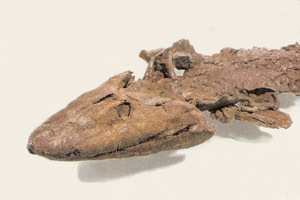 Let's reword The Revelation of Ares, which dubs me eldest brother (16/1), so I turn into the eldest tiktaalik. What's dat? If the Ares Pilgrims were against evolution, they would not believe in what is essential in The Revelatioon of Ares, that is, the fact that man has been able to demean himself, fall (Adam, Rev of Arès 2/1-5 and VII/8-16), and that he is likewise able to straigten up (1/1), get over sin, evil and misfortune, resume his spiritual position as the creator's son and as co-creator, therefore. If we, you or I or every one of men, can evolve, it is because evolution is a global ability of everything in the creation. A new proof of evolution has lately appeared: A tiktaalik roseae (picture), a fish with embryonic legs, a 375-million-year fossil the name of which means "large fish in the stream" in Inuit (Eskimo), has been dug out of Ellesmere Island, Canada. The fossil shows that terrestrial life has come out of the sea. Some fish have grown legs, which enabled them to crawl along, and then later walk, on shores. So doing they have developped their brains. To us anything an animal can do corporally and cerebrally we humans can, particularly as far as morality and spirituality are concerned, because these are in great need of improvement. So we believe in The Revelation of Ares's verses: ...I (Creator) breathe silently into men's chests. For the Truth is, the world has to change (Rev of Ares 28/6-7). Everything changes, which is essential truth and, what's more, everything has to change. Everything is able to change, therefore. Besides, The Revelation of Ares adds, do not finery and joy suit to him who has changed his life (30/11)? Why, then, the legless fish, the representatives of organizations like Mivilude, Adfi, Ccmm, etc., who claim that they throw light on some "dangers" to "youth and families", issued a while ago a "record" which spreads a warning that we are "a sect devoted to illegal healing"? —A blunder not really abusive but doubly false, as the Ares Pilgrims do not have a sectarian spirit and do not practice healing, whatever , are now telling that we are "people behind the time, opponents of evolution"? I happen to guess, however, why they spread such untruths. First, because they heve never read The Revelation of Ares or the books related to it. Second, because they find it a justifiable parry that falsities are spoken up against whatever disconcerts them. Why? Simply, because we have left the abyss of the "religiously correct", the "politically correct", the "atheistically correct", in short, the "correct thought" abyss, and we have started proceeding upward, to the clear surface waters of the Sea (Rev of Ares 20/4+elswhere), to an evolution, which they consider as hazardous. And yet we do not attack anybody. We have respect for the beliefs and freedom of everybody, our enemies included. Isn't the peace within us a sign of evolution, as it is, in days when people fly into rage very easily? Submitted, your post misses the question about evolution. The orthodox position is that evolution occurred by random mutations, meaning that the Book of Genesis is wrong in saying the plants and animals were created. However, in 2004 an English fossil expert called Parker wrote a book called "In the Blink of an Eye." It showed that the extremely complex flesh and muscle and nerves of the vision faculty arose simultaneously (on the archaeological scale!) in five, say again five, phyla [a phylum is a line of descent within a biological group presumably from a single point of origin]. This shows that chance is ruled out, whereas an intelligent actor could have learnt once, slowly, and then repeated the feat, quickly. Thus the orthodox evolutionists are discredited. The only issue is whether the "cause" of evolution is the same as the "cause" of the Big Bang, the origin of life, and the origin of consciousness. Incidentally, Darwinian evolution was never science: it can explain any form of life that is discovered, and therefore can make no predictions. I personally am not very interested in the "technical" aspects of evolution, for instance, whether Darwin or Parker has issued the right theory. I'm aware of one thing: Any being or thing in the universe is imbued with an intent the Creator has put in him or her or it and and evolves according to it, considering that the Creator may any time say, "The air be heavy!" and the ship drops like the stag into the ravine (Rev of Ares XVI/11), that is, the Creator can change the laws of physics or life any time. It seems to me that the main idea of the Aresian movement is to encourage us to embark upon freely chosen evolution of humanity towards GOOD. Looking for change, for movement, is one way to determine whether or not there is life.